The redshirt freshman also talked about which teammates he tries to learn from as he continues adjusting to the new position. » UCLA has a clear-cut No. 1 option in Paul Perkins, who said his goals this season are to be the nation’s top tailback and to win a national championship. That’s allowing the Bruins to give even first-team reps with some of the newer players. Two days into camp, the main beneficiary has been five-star running back Soso Jamabo. On Tuesday, he not only got a healthy share of time on the first and second string, but even took five or six snaps out of Wildcat. Jamabo honestly hasn’t quite matched his recruiting hype on the field, but it’s still fairly early in camp and UCLA doesn’t need instant production from him. I wouldn’t be shocked to see him become more of a pass-catcher than a workhorse runner, but offensive coordinator Noel Mazzone said he doesn’t foresee any position changes for the 6-foot-3, 210-pound back. » Chris Clark remains sidelined with mononucleosis, but Mazzone said that won’t affect UCLA’s implementation of a new tight end package. Nate Iese, Thomas Duarte, Colby Cyburt, Tyler Scott are the options there for now, which sounds similar to the rotation UCLA used at Y-receiver. 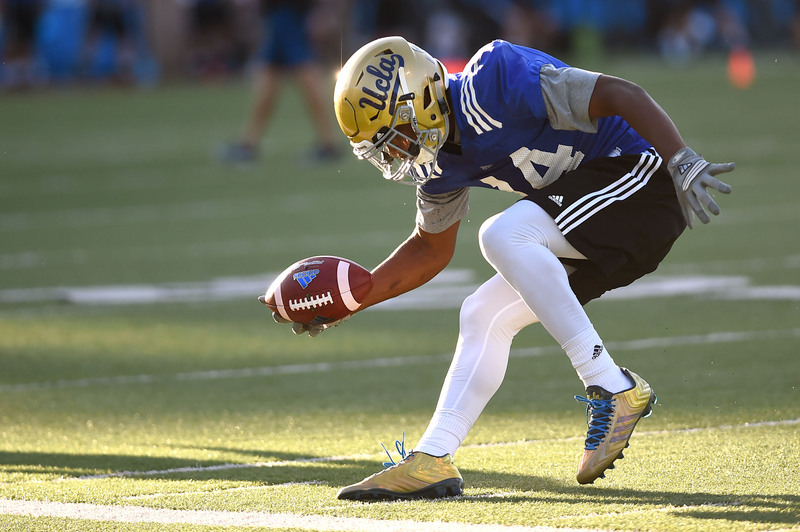 UCLA has not produced a 1,000-yard receiver since 2011. Looking at the state of the Bruins’ offense, it’s a good bet that the drought will extend for another season. Such is the nature of offensive coordinator Noel Mazzone’s scheme. For three years, UCLA has divvied up targets between bevy of receivers, racking up significant total yards without creating a dominant No. 1 wideout. In 2014, Jordan Payton became the first Bruin to record more than 60 catches in the Jim Mora era; that same season, 12 others in the Pac-12 cleared that same threshold. » UCLA head coach Jim Mora talked after UCLA’s final spring practice on Saturday at the Rose Bowl, and immediately quashed the biggest question of the Bruins’ offseason: Who will be the new starting quarterback? “I don’t think we’re any closer to a decision than we were when we started spring,” he said, with more or less a straight face. And he isn’t planning to name one until the season-opening kickoff against Virginia on Sept. 5. Regardless of what happened through four weeks of spring practice, the coaching staff has consistently insisted that no hierarchy has emerged among the four candidates vying to be Brett Hundley’s successor. On Saturday at the Rose Bowl, all four got 11-on-11 reps. Jerry Neuheisel and Josh Rosen ran with the first-string, while Asiantii Woulard and Mike Fafaul got their chances with the second string. Rosen subbed in for 11-on-11s more than an hour into practice, and completed his first five passes. His sixth was a nice-looking 35-yard pass to Logan Sweet, but cornerback Marcus Rios reached over and tipped it away at the last second. He eventually finished 13 of 17 with two touchdowns and an interception on the day, with the pick going to Johnny Johnson. As has been the case at times this spring, Rosen didn’t look as sharp during seven-on-sevens. He missed a couple of back-to-back swing passes to Paul Perkins, one thrown slightly too far ahead and the other thrown too low. UCLA has done this before. There was Darius Bell, who transferred in, switched positions, and left Westwood with 302 receiving yards and a touchdown. There is Devin Fuller, who ranked second on the team with 59 catches as a junior last season. As far as quarterback-to-receiver projects go, the Bruins haven’t fared too badly. Next up is Aaron Sharp, who signed as a three-star recruit in 2014. After spotting as a scout-team target late last season, the Houston-area product has all but made the pass-catching transition final.